LATTRÉ / JANVIER -L'Afrique divisée en ses principaux Etats. . .
LATTRÉ / JANVIER,Sr. - L'Afrique divisée en ses principaux Etats. . .
L'Afrique divisée en ses principaux Etats. . . - LATTRÉ / JANVIER,Sr. 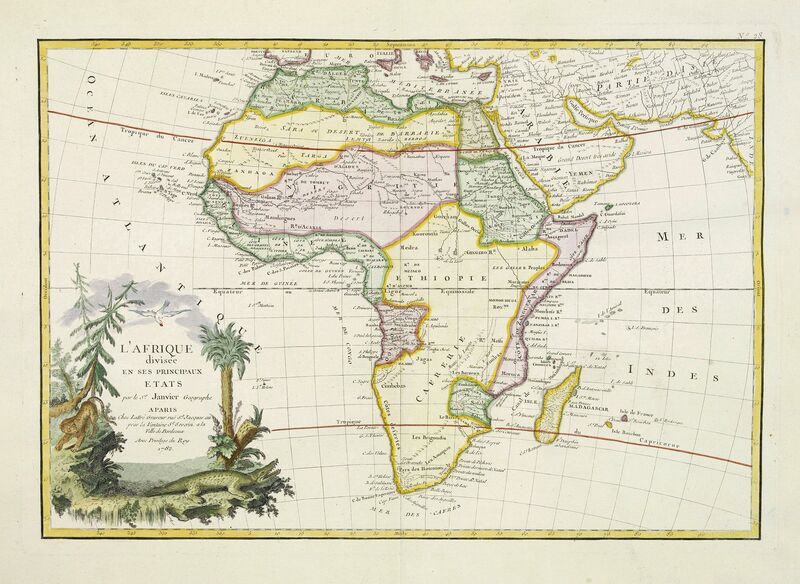 Title : L'Afrique divisée en ses principaux Etats. . ..
Map maker : LATTRÉ / JANVIER,Sr.. Date : Paris, ca 1783. Size : 11.9 x 17.2 inches. / 30.3 x 43.7 cm. Description :Attractive map of Africa, ornated with a decorative title cartouche showing luxuriant nature and native animals. Boundaries outlined in hand colour. Prepared by Le Sieur Janvier, Jean denis [Robert], French geographer and cartographer. In addition to work published under his own name by Jean Lattré in Bordeaux and C. F. Delamarche in Paris, he collaborated with other cartographers and publishers in producing a considerable number of maps, many of which were used in general atlases by William Fadan, P. Santini and others. Tooley (Af) p. 59, cf. Norwich 104. Condition : Paper washed, with good margins. Good impression.